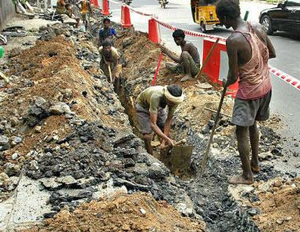 Mangaluru, June 8, 2016: The ongoing work to lay cables in many busy parts of the city is proof that rules are only on paper, and meant to be broken. MCC, Mangaluru City Corporation normally doesn’t grant permission to any agency to dig trenches on either flanks of the road once monsoon sets in. All because it endangers road users who may have to use the shoulder for emergency stops and pedestrians, children and the aged are injured and endangered. Despite this, an agency has been digging a trench on the road shoulder opposite Barke police station abutting Gandhinagar Park but also laid cables in it. Workers are digging one side of the road leading to Canara High School at Urva in front of Sri Satya Sai Mandir. The dug-up earth piled up on the road ends up inconveniencing motorists and pedestrians alike. This is only a sample and can be seen all over. Shivashankar Swamy, deputy commissioner (development) and superintending engineer, was informed about this work going on about 500 metres from the MCC’s main office at Lalbagh, he said he’ll ask his staff to check it. He asserted that no fresh permission had been granted for digging trenches to lay cables and said the civic body insists on all agencies do horizontal drilling, not resort to road cutting. Lancelot Pinto, chairman, standing committee on town planning and development, MCC, too said he was not aware of permission given for such work. "The agency could be executing work on permission given earlier," he surmised, adding, "Digging of roads or shoulders during the monsoon is strictly forbidden."